So in 2005 all the big donor countries set themselves a bunch of targets for making their aid more effective. The results are in. 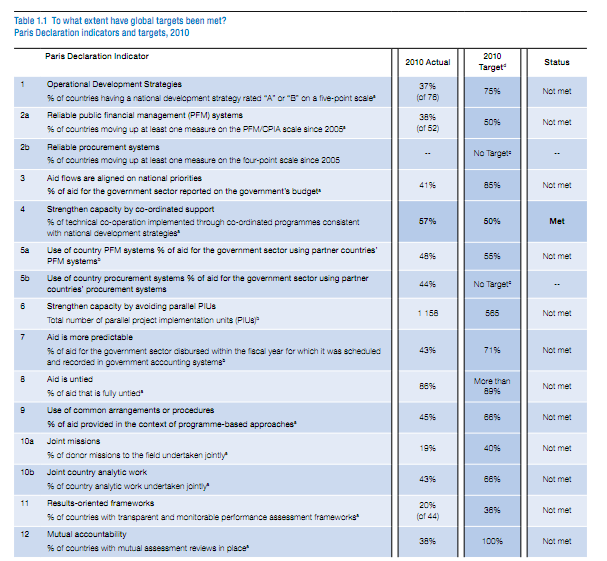 "The results of the 2011 Survey on Monitoring the Paris Declaration are sobering. At the global level, only 1 out of the 13 targets established for 2010 has been met. Nonetheless, it is important to note that considerable progress has been made towards many of the remaining 12 targets." "If developing countries had hit as few targets as the donors have met on the Paris Declaration we would have cut off their aid." And to paraphrase Owen, this is all sadly a bit predictable. The targets are inconsistent with the incentives facing donor agencies. We need new ways of working, including much more transparency and better data (for more - see here).